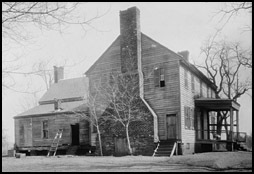 Comments: Joshua Fry, one of the founding fathers of Albemarle County, Virginia, built the original Viewmont house by 1737. That structure burned before 1800 but was rebuilt on the same foundation. Shown in these two 1937 photos, the second Viewmont retained the old massive chimneys at either end of the house. Located nine miles northeast of Scottsville on Rt. 20 between Keene and Carter's Bridge, this Viewmont house also was destroyed by fire in 1939. A third house was built at Viewmont in 1941 and again employed the original chimney brick in its walls. 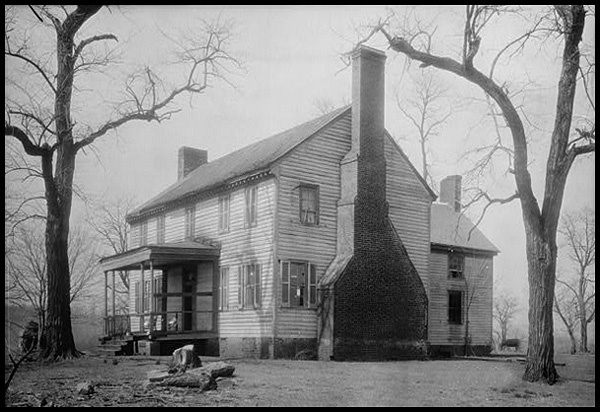 Other owners of Viewmont included Virginia Governor Edmund Randolph (1786); William Champe Carter (1798), Captain John Harris (1803); and Anna Maria Barclay Moon and her husband, Edward Moon (1832). The Moons were instrumental in starting the first Baptist congregation in Scottsville, and two of their daughters left Viewmont as adults to undertake important roles in the world. Oriana Moon became a physician and served at the Confederate Army's General Hospital in Charlottesville during the Civil War. After the war, Oriana and her husband, Dr. John S. Andrews, operated a hospital at Old Hall in Scottsville from 1882-1883. Her younger sister, Charlotte "Lottie" Digges Moon, became a famous Baptist missionary to North China and spent nearly forty years in China. She died of severe malnutrition on Christmas Eve, 1912, after sharing her meager money and food with the starving Chinese people around her mission. The top Viewmont photo was provided courtesy of the Library of Congress, Prints and Photograph Division, Washington, D.C. 20540; Call Number: HABS, VA, 2-CHAR.V.2-2 (160638pr). The Viewmont image at right is also provided courtesy of the Library of Congress; Call Number: HABS, VA, 2-CHAR.V.2-3 (160639pv).